Can we make payments even if we don’t work for the state anymore. Write “loan payment” on the check and include your registration number or the last four digits of your Social Security number for identification purposes. If you’ve already retired, it isn’t possible to pay off your loan. Any loan balances at retirement will permanently reduce your retirement benefit. 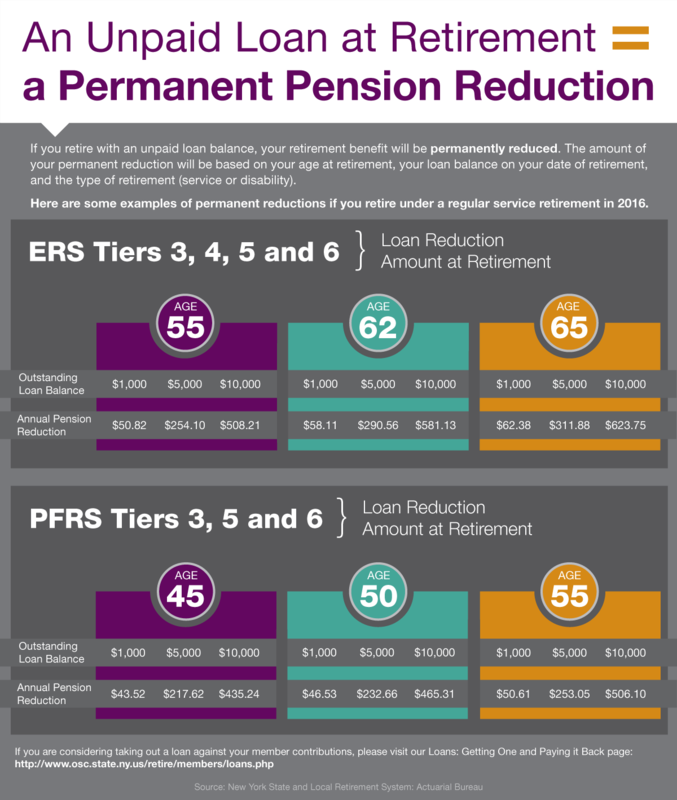 On the infographic in the blog post above, you can see the retirement loan reduction amounts for 2016. Why is it a permanent once the loan is paid off. Retirees cannot have loans, so if a member has an outstanding loan balance at retirement, the balance must be paid before we can finalize the pension benefit. If the member doesn’t send a payment to pay the loan in full, the balance is paid by a permanent reduction in the pension. The amount of the reduction is calculated to pay the outstanding balance over the member’s lifetime and is based on actuarial tables. Since an outstanding loan balance permanently reduces a member’s retirement benefit, why is it taxable by the IRS (1099R)? The money appears to be already absorbed through the reduction in payments. IRS regulation makes some or all of an outstanding loan balance taxable at retirement, and the taxes go to the IRS, not NYSLRS. For more information, you may want to consult a tax advisor or visit the Retirement Plan Loans section of the IRS website. I took a loan put before i lost my job. I was taxed by the irs for 500.00. I had no income and have been collecting disability for 10 years. How can my loan be minus by 28,000. Afterall this is monies that i paid from my earnings every two weeks. Unfortunately, the NYSLRS social media team does not have access to your personal account information.